My latest project was so far out of my comfort zone that I needed the help of my Mum. I have never tried to knit or had any interest in knitting until I stumbled across a knitted crew neck sweater by Abolajiooo on Instagram. If you are not following this talented and creative lady yet I strongly suggest taking a look at her feed. She is probably my favourite maker to follow on Instagram at the moment. I was so blown away by her knit that I wanted to give this knitting gig a go. My Mum, who can knit, was coming to visit and I decided to take full advantage of her skills to get me started and on the right track. One thing I have always had in common with my Mum is our desire to create garments. I absolutely love that she is still passing maker skills down to me as we both grow older. Following on Abolajiooo’s lead I purchased a e-pattern book by Good Night, Day from Ravelry with the intention to make the Strathcona Sweater but feel in love with the Carlisle Cardigan. I have used a 100% Acylic Moda Vera Monkey yarn in the colour Red. This was purchased from my local Spotlight Store. I can multi task while sewing but I certainly can’t multi task while knitting. It requires my full attention. If my mind wanders for just one second, I’m wrapping yarn around the needles the wrong way and knitting when I should be purling. Luckily I had the watchful eye of my Mum to find the mistakes and fix them before it was too late. Then she had to go home and hence the big mistake down CF on one side where I somehow acquired additional stitches. By the time I got to constructing the sleeves I was able to identify a knit stitch and purl stitch and pick up mistakes before I got too far along to correct them. There are definitely tension issues in my cardi but overall I’m pretty stocked with the finished product. We are still in the middle of winter here in Australia so my new cardi won’t be getting any wear time soon. On the upside it is ready to go as soon as the weather does get cooler. 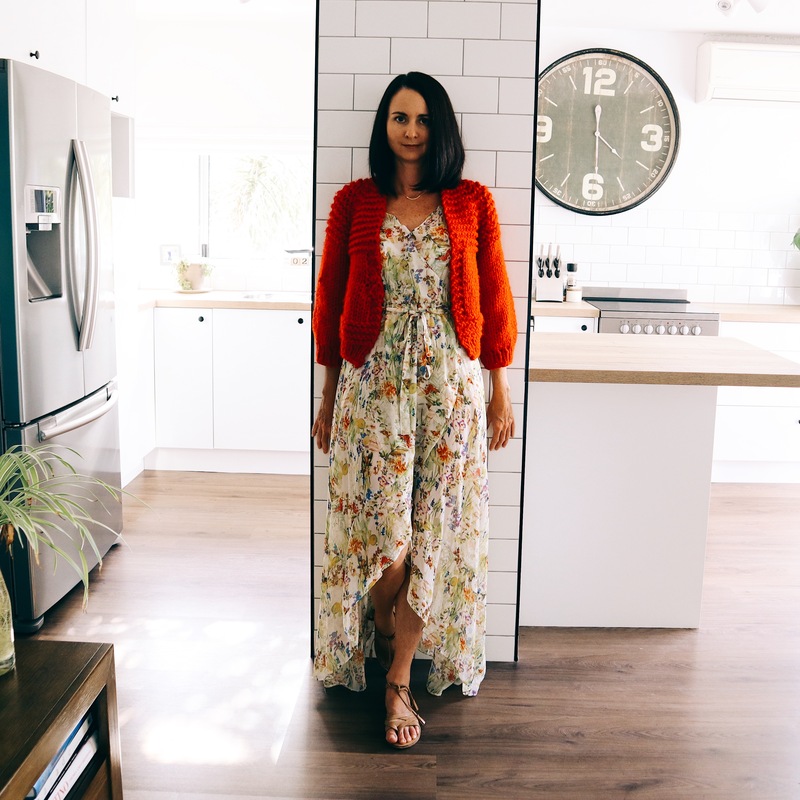 I love the way this cardi can be styled with anything from jeans to dresses. It is truely a versatile wardrobe piece. Next on my knitting pile will be the Kingstone Sweater……. Next Post How to create a button through cami from any cami pattern in your stash….